An F-22A Raptor cruises the skies above Langley Air Force Base, Va. The Air Force says that replacing 20 aging F-15 Eagle combat jets with an equal amount of the sleek stealth F-22A Raptors will have no significant impact on the island's environment. By 2011 the Air Force's newest and most expensive jet fighter -- the F-22A -- will be flown by air crews belonging to the Hawaii Air National Guard's 199th Squadron and the active Air Force's 531st Squadron. Yesterday the Air Force in a 260-page environmental assessment that found "no significant impact" from staging the new combat fighters at Hickam Air Force Base. The document said the Hawaii Air National Guard is now working with the Federal Aviation Administration to revise the landing approach patterns used by the F-15 jet fighters so there will be no discernible change in noise. The jet engines on the Raptors are more powerful and louder than the F-15, the report said. The Hawaii Air Guard hopes to avoid straight-in landing patterns to cut back on the noise of the jet engines. Military flights, which account for 5 percent to 6 percent of the 880 daily flights at Honolulu Airport, are expected to increase, the report said. "Military average operations, including based and transient aircraft, would increase from 53 with the F-15 to 65 with the establishment of the F-22A squadron," the report said. 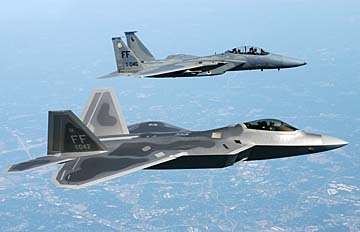 Over water the F-22 trains at a higher altitude that the F-15, the report said. That means many of the sonic booms generated by the Raptors would be detected as "distant thunder." The Raptor flies at 1.5 times the speed of sound and costs more than $136 million, the most expensive fighter in Air Force history. It can lock onto an enemy fighter 40 miles away and take it out with a missile before the other aircraft realizes it has been targeted. The environmental report said none of the buildings at the Hawaii Air Guard site proposed for renovation or demolition meets the designation as a historic structure. The Air Force said that 20 facilities at Hickam will be renovated or built over the next five years at a cost of $145.4 million. The Hawaii Air Guard has flown the F-15 jets since 1987. The existing jet fighter alert facility was built in 1958 when the Hawaii Air National Guard flew F-86 Sabre jet aircraft. Printed copies of the document are available at the Wahiawa, Pearl City, Aiea, Kaneohe, Kapolei and Salt Lake Moanalua public libraries; the Hawaii State Library; University of Hawaii-Manoa Hamilton Library; Waimanalo School library; Ewa Beach School library; or the Hickam Air Force Base library; or online at www.pacaf.af.mil/library/ pacificf-22/index.asp.